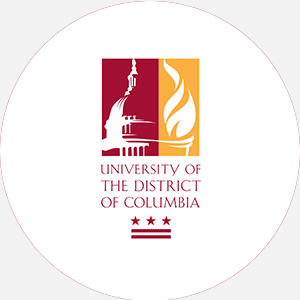 University of the District of Columbia (UDC) is a four-year, district-supported, liberal arts instit…. University of the District of Columbia (UDC) is a four-year, district-supported, liberal arts institution founded in 1976 as a result of a merger between District of Columbia Teachers College (1955), Federal City College (1966), and Washington Technical Institute (1966). Although UDC had its formal founding in 1976, its history goes back to 1851 with the founding of the Miner Normal School for colored girls, which merged with the Washington Normal School for white girls, which later merged in 1955 to form the District of Columbia Teachers College. The Federal City College and the Washington Technical Institute were both established in 1966 as a result of the Chase Commission, appointed by John F. Kennedy, which determined the need for a liberal arts and teachers’ college in the District. Both schools were given land-grant status that same year. After the District of Columbia was granted home rule, a mandate for consolidation of District of Columbia Teachers College, Federal City College, and Washington Technical Institute was issued in 1975. The Cooperative Extension Services Program is one means by which UDC fulfills its land-grant mission. Through its outreach program, it works directly with District of Columbia residents to solve problems related to improving the quality of life. UDC also operates the District’s Agricultural Experiment Station and Water Resource Center. UDC’s three campuses offer students all of the advantages of major universities. Students can easily commute between campuses via public transportation. The Van Ness campus, in upper northwest Washington, D.C., is a modern campus situated on 21 acres that houses the academic facilities for the Colleges of Liberal Arts and Fine Arts, Life Sciences, Physical Sciences, Engineering, and Technology. The Mt. Vernon Square campus in the downtown area leases facilities for the College of Business and Public Management and the graduate division. The Georgia Harvard Campus in midtown northwestern Washington offers the majority of programs in the College of Education and Human Ecology. Graduation from an accredited high school and completion of the following units: 4 English, 2 mathematics (algebra and geometry), 2 lab sciences, 2 social sciences, and 2 foreign language. Students must submit an official high school transcript and provide proof of immunizations against measles, mumps, rubella, tetanus, diphtheria and polio. A recent physical by a physician is required. Preference is given to D.C. residents. A application fee is required. A minimum of 120 semester hours and completion of core requirements to include the following hours: 6 English (composition, literature, and advanced writing), 6 mathematics, 6 natural sciences, 6 social science, 3 philosophy, 3 fine arts, and 4 personal and community health. Students must maintain a minimum 2.0 GPA. The last 30 hours must be completed in residence for bachelor’s degrees; a minimum of 60 hours and last 15 hours in residence for an associate degree. Student Life	Campus Regulations: Hazing prohibited; honor code; freshman orientation is held during the fall semester. Campus Services: Health center, personal and psychological counseling, career planning and placement, student employment services, remedial instruction, diagnostic testing, testing center. Campus Activities: Social and cultural activities include theater, band, jazz ensemble, chorale, art exhibits, orchestra, drum and bugle corps, and dance. Annual events include International Day, Cross Cultural Extended Family Program, Family Community Day Picnic, and International Multicultural Recognition Day. In celebration of Black History Month, the University hosts exhibits, lecturers, and concerts. Students may get involved in the UDC Trilogy (student-run newspaper) or the Firebird (yearbook). Communication majors or volunteers can work at the student-run jazz radio station, WDCU-FM 90.1. Leadership opportunities can be found in the Student Government Association (SGA), which sponsors more than one hundred activities including class mixers, chess and table-tennis tournaments, free movies, popular music groups, and numerous workshops on a variety of subjects. Greek sororities include Alpha Kappa Alpha, Delta Sigma Theta, Sigma Gamma Rho, and Zeta Phi Beta; fraternities include Alpha Phi Alpha, Kappa Alpha Psi, Omega Psi Phi, and Phi Beta Sigma. Honor societies are also represented on campus. Housing Availability: None (off-campus living only). Handicapped Services: The University is wheelchair accessible. Available facilities include elevators, lowered drinking fountains and telephones, specially equipped restrooms, and wheelchair ramps. Services are also available for hearing and visually impaired.